These Crispy Baked Dill Falafel are a healthier version of the beloved Middle Eastern food! Falafel, I love you so much. I love your crispiness, yet your dedication to being fluffy, your slightly warm outside and piping hot inside. I think it is safe to say that I’m addicted to you. 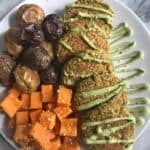 I would eat it every single night if I was able to, and now I may be able to because I just came up with the BEST ever crispy baked falafel. 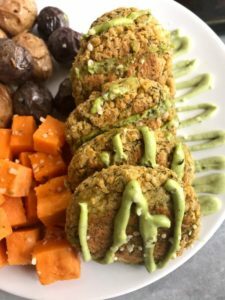 Typical falafel is deep fried, and while it is super tasty and I definitely still eat it that way too, I wanted to recreate that typical fried version but healthier. Well, I found the trick to creating that PERFECTLY crunchy crust outside and a perfectly soft and fluffy inside. I made these for a Friday night dinner during lent, because my meat loving boyfriend probably wouldn’t be too happy with me cooking on a Friday since we typically go out. But since he can’t have meat on Fridays, I’ve been cooking up a vegetarian storm and he has truly enjoyed the things I’m making. Especially these falafel. We made Lee From America’s cashew dill sauce to put on top, as seen in the pictures and that really took them to the next level. 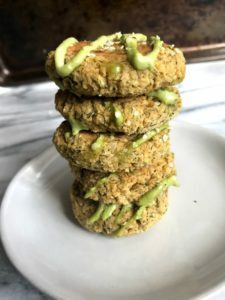 If you love the deep fried version of falafel but want a healthier version, you MUST make these!! They won’t disappoint. In a food processor, add chickpeas, dills, garlic, onion, tahini, and lemon juice. Blend together and scrape down sides. Add in oat flour, salt, pepper, and cumin. 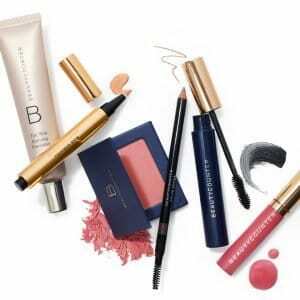 Blend to combine. Using cookie scooper or hand, form into patties. Brush oil on top of patties and bake for 14-18 minutes, flipping halfway through and dowsing with oil on the other side.